House of the Papuan Peaceful Community or abbreviated as RM Papeda is an innovation of Jayapura Police, Papua Police, entering the top 99 of 2,824 proposals of innovation of public service information in the Public Service Innovation Information System (Sinovik) which entered in the admin of Kemen PAB-RB. Proposal submission of this public service innovation in the framework of public service competition within the Ministry, Institutions, Local Government, BUMN and BUMD in 2018. There are 2,824 proposals for innovation of public service information in the Public Service Innovation Information System (Sinovik) which entered in Kemen PAB-RB admin, there are 1,689 public service innovations with the status has been submitted to admin of PAN-RB Kemen. Through administrative selection, 1,463 resulted were passed to the proposal assessment stage. The evaluation team then proceeds through Sinovik and submits the result to the Independent Panel Team. Through intensive discussions on the results of the proposal assessment, the Independent Panel Team determined the Top 99 Public Service Innovations in 2018, and the public service innovation of RM Papeda owned by the Jayapura Resort Police was included. According to Jayapura Police Chief, AKBP Victor Dean Mackbon, SH., SIK., MH., M.Si, public service innovation RM Papeda is a system built to improve communication between the community, police and other stakeholders, by building bridges in the form of Frequency Kamtibmas integrate radio communication system of HT (handy talky) in community, with radio communication system of Polres Jayapura and other stakeholders. Victor explained that the main components of RM Papeda are Frequency Kamtibmas, Patrol RM Papeda, Mobile Public address, Ambassador RM Papeda and Siar RM Papeda. Kamtibmas Frequency is a two-way radio frequency (HT) of 146,980 Mhz / 146,380 Mhz which is specially allocated as a means to be used by two-way radio users in providing all the important information related to the situation in their respective territories. While Patrol RM Papeda is routine frequency patrol kamtibmas conducted to check the situation of the region and to respond and serve the community. Public Address Mobile is a preventive effort in the form of kamtibmas appeal, which informs the leadership or government policy and conveys the kamtibmas message by using loudspeakers installed on motor vehicles of Jayapura Resort Police. "Meanwhile, the Ambassador of RM Papeda is a follow-up, in order to give deterrent effect to the perpetrator of public sickness and crime which is a mild criminal act, by becoming Duta Kamtibmas in delivering kamtibmas messages," he explained. 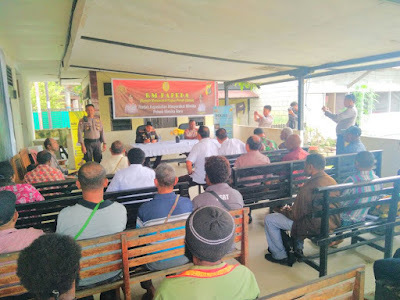 While Siar RM Papeda is from various information obtained from kamtibmas frequency through RPU RM Papeda, as a form of interaction through radio talkshow in cooperation with Jayapura Regency Government. "Why RM Papeda? The geographical area of Jayapura Resort Police is very wide and the number of members of Jayapura Resort Police is limited and the community is very diverse. In addition to the high cost of telephony in Papua compared to other regions in Indonesia, and the dependence on phone providers as well as the spirit of partnership and equality in providing services, "said Victor. The real benefit of RM Papeda in addition to using simple, inexpensive and self-sustaining technology, can improve the rapid response of Police and other stakeholders. Narrowing the space for perpetrators of criminality, improving communications between the community, police and other stakeholders and participating in community participation Kamtibmas manpaga.